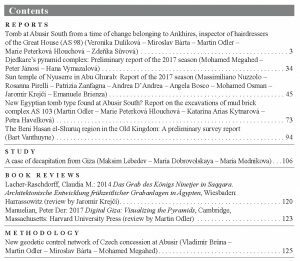 Latest issue of the journal Prague Egyptological Studies (XXI/2018) has been published! The Czech Institute of Egyptology (prior to 1993, the Czechoslovak Institute of Egyptology) celebrates its 60th anniversary in the year 2018. The beginnings of its activities in the field are closely tied to the UNESCO campaigns organised in the early 1960s in order to save monuments of ancient Nubia in connection with the construction of the Aswan High Dam. The archaeological works on the pyramid field of Abusir, which took place only a few years later, were originally focused on the Fifth Dynasty mastaba tomb of Vizier Ptahshepses. The concession at Abusir as well as the tomb itself had a significant impact on the evolution of the Old Kingdom studies centred in Prague. 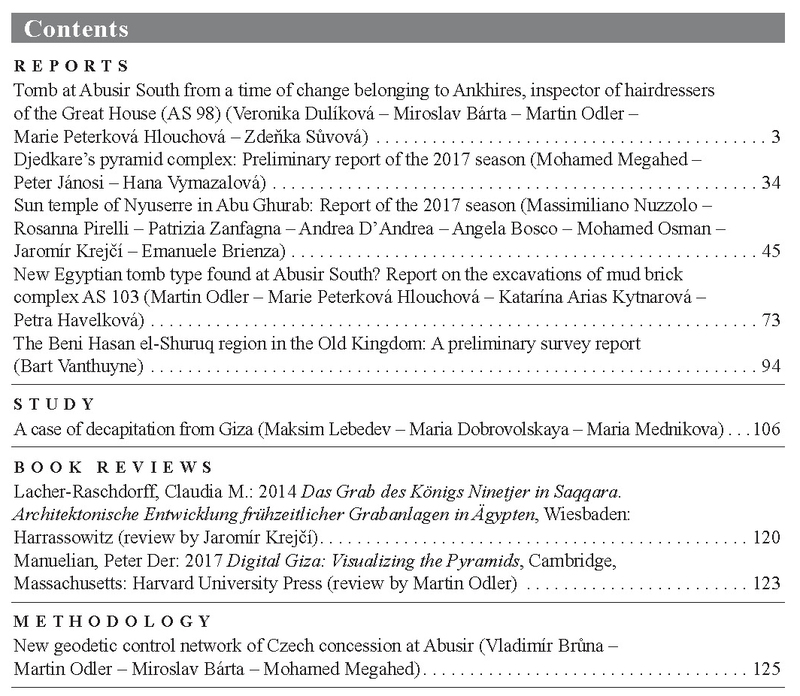 It is hoped that the new reports and studies presented in this issue of the Prague Egyptological Studies will further the knowledge of Third Millennium BC Egypt. Published reports include one on the tomb of Ankhires, inspector of hairdressers of the Great House (AS 98) recently discovered in Abusir South and dated to the reign of Nyuserre. Another study dedicated to Djedkare’s pyramid complex summarises major achievements of the 2017 season on the site. The history of Abu Ghurab’s sun temples is covered by a report on the 2017 season documenting architectural vestiges preserved in the temple complex of Nyuserre. The penultimate paper deals with a new necropolis of specifically designed tombs discovered in Abusir South underlying the temple of Ramesse II. The concluding text in this part presents a preliminary survey summary on the Beni Hasan el-Shuruq region during the Old Kingdom. The reports are followed by a study focusing on a specific case of decapitation attested from Old Kingdom Giza. The issue continues with reviews of two recent publications. The first one focuses on the complex of Ninetjer painstakingly excavated by the German Archaeological Institute in Saqqara while the second offers an impressive example of the use of 3D modelling and virtual reality techniques applied to the pyramid field in Giza. The final paper is dedicated to methodology of geodetic works carried out in Abusir. 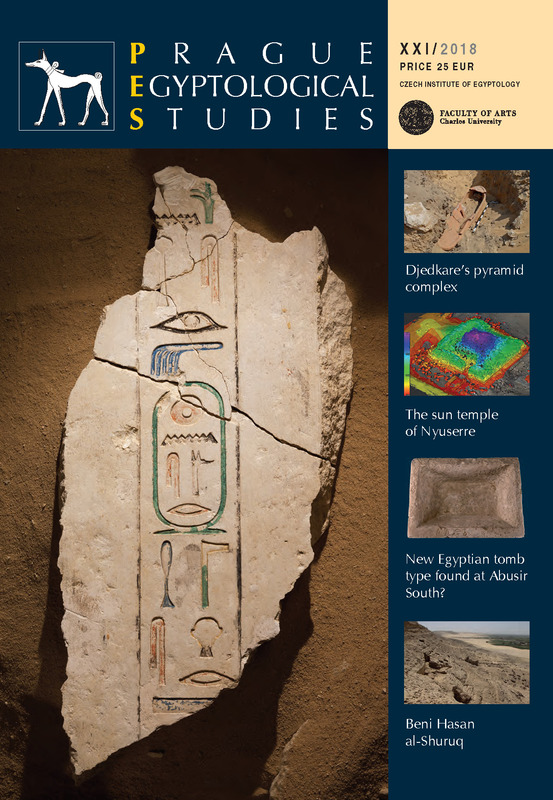 The issue covers a broad range of topics dealing with exploration not only at the Memphite necropolis but also in the provinces, describing new methods and approaches to the research. As most studies provide a more general framework for the presented data, thus gaining on universal relevance and significance, they may be of interest not only to Egyptologists but also to laypeople and specialists from other fields of archaeological or historical studies. The journal can be ordered in the e-shop of the Faculty of Arts, Charles University or in the bookshop Karolinum. 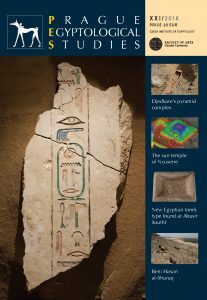 Úvod > News > Latest issue of the journal Prague Egyptological Studies (XXI/2018) has been published!